BISCUIT formed in 1995 in Melbourne, with Wesz Parry on vocals, Matt D'arcy on drums, Jake Nicolaisen on bass and Chris Carty on guitar. 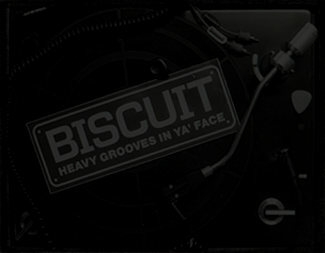 BISCUIT have recorded 3 EPs to date, all of which were self-funded. In May, 1995 the band made their debut with Loonacy, a 4-track EP, which they recorded with a previous guitarist. It was selected to be part of a World-Wide HeadWorx Surf Video (Escape Indo Express 2) distributed by Eastern Film Corporations. Soon after the Loonacy release, Chris Carty joined the band. The 1996 release of Lizard Head, a 6-track EP, marked the the start of BISCUIT's reign in the Melbourne music scene, and established them as an original, heavy/groove based band with a solid live following. A Manga Movement followed in late 1998, showing once again the talent and raw power that is BISCUIT. Over the years, BISCUIT have developed a solid entourage of live followers and fans, growing rapidly from continual licensed and all-ages shows they perform in and around Victoria. Touring Victoria, playing a minumum of 50 - 60 all-ages shows annually, their animated performance attract huge audiences from all around, creating mayhem and exhaustion from energy packed shows. Of late, BISCUIT have also had the opportunity to tour interstate, setting a trend for future events. They have also performed on such festivals as The Falls (97), Offshore (97), Pushover (97 & 98), Bayfest (Batemans Bay, 98), and the Vans Warped Tour (99).